It was a case of back to the beginning for the last game of the Bundesliga season: bad weather. The first match against Göttingen was played under grey clouds with intermittent snow. The last match against HICC was delayed for 90 minutes by rain. 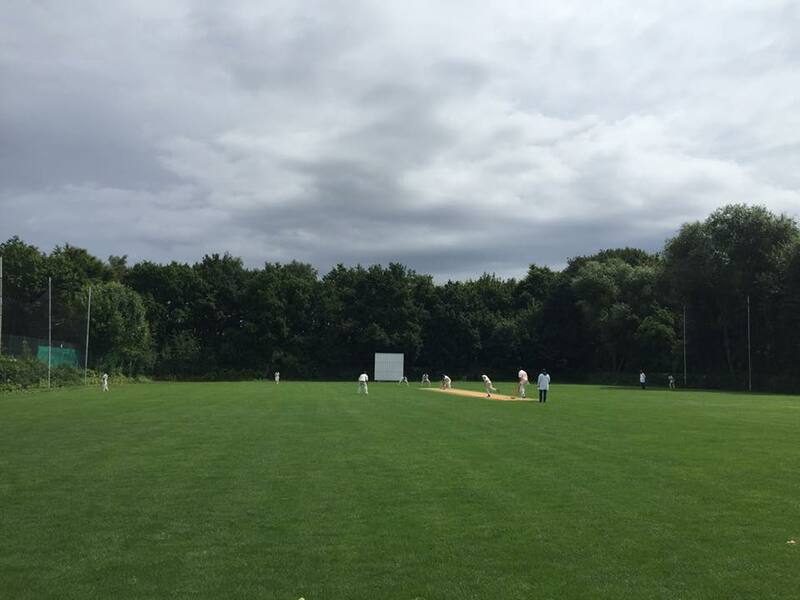 When play finally got underway, with THCC’s new sightscreens in place, the match was reduced to 40 overs. Batting first, THCC struggled to reach 139 as four of the team’s top six batsmen were given out LBW, with skipper Cam getting an inside edge and the ball hitting him on the right hip, and still being made to walk, out LBW. Marvin was the best with the bat, hitting 48. Israfeel, Imran, Kamal and Saied also did well to take the score from 7/78 to a more respectable 139, which gave the bowlers something to defend. That defence started brilliantly, with Israfeel clean-bowling two HICC batsmen in his first over, and bowling another in his second over to leave HICC reeling at 3/5. Kiran and Ayush steadied the innings, but when Imran got Kiran and Saied had Herry out, THCC could sense victory. Some big hitting from Ayush bolstered the score, but when he was bowled by Israfeel, the resistance was gone. Marvin took a great catch at first slip to remove Rajvinda, off Cam’s bowling, and Israfeel took the last wicket to complete his 5-for. After a season of ups and downs, the 63-run victory against HICC means THCC squares they ledger, with five wins and five losses, to finish fourth in the NDCV league. Thanks to Chris and Alan for scoring, and thanks to the supporters who braved the weather to watch the game. Mittwochs, 18.00 bis 20.00 Uhr. Freitags, 17.30 bis 20.00 Uhr. Sonnabends, 10.30 bis 12.30 Uhr. Sonnabends, 10.00 bis 12.00 Uhr. Sonnabends, 10.30 bis 12.00 Uhr. Donnerstags, 18.30 bis 20.00 Uhr.